The parish churches in the benefice of Toddington and Chalgrave are delighted you wish to be married and will remember you in their prayers until and beyond the ‘big day’. This page is to help you to prepare for your wedding. If you choose to get married in church, there is an added dimension – the assurance that God cares about your relationship and that his resources and strength are available to help you. Including God in your marriage doesn’t mean that you will avoid all the usual ups and downs, but you will know that you can look to God for help and guidance and that his love will sustain you. You will also have the support and encouragement of the Christian Church family. Christians believe that marriage is a gift from God. In the marriage ceremony, a couple make a public declaration of lifelong commitment to love each other, come what may. The Bible compares married love with the love Jesus has for his followers. He expressed his love by being prepared to sacrifice himself, even to die for the people he loved. This is amazing, unconditional love. Jesus never said ‘I love you, but …’. In our marriages we can try to follow his model by loving our partners in a self-sacrificial way, putting their needs before our own. The marriage ceremony gives you a new legal status, as husband and wife and a new stability within which your relationship can flourish and grow. Christians believe that marriage offers the right place for the fulfilment of our sexuality and that it provides a stable and secure environment for bringing up children. paperwork completed. If you have any worries or concerns please do not hesitate to contact the Weddings Administrator or the Rector. Marriage usually follows the calling of banns; if you don’t know what this means the Rector will explain. Banns need to be called in the Church of the parish in which the marriage is to take place and also the parishes in which the bride and bridegroom live, if different. You may be required to provide a Banns Certificate from other parishes and they will make a charge for this, the Weddings Aministrator will advise you on this point. 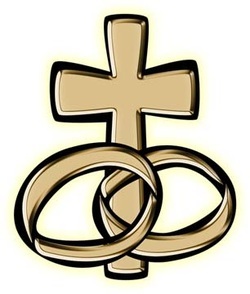 For couples wishing to marry outside their own parish, that is Toddington or Chalgrave, the cost of providing a Banns Certificate will be advised by the Weddings Administrator. This will cover the‘calling of the banns’ and the certificate of publication. In certain circumstances marriage has to be by licence and if this applies to you the Rector will tell you and explain what you need to do. When you book your wedding, you will be required to pay a £50.00 deposit. If you cancel your wedding booking, £40.00 will be refunded to you if you give the Rector more than four months notice of cancellation. £10.00 will be retained for administration costs. Fees, which are set out later on this page, must be paid one calendar month before the wedding and a bill will be sent to you well in advance of that date. Please also make sure that we know your requirements for music, flowers etc. as early as possible. The video copyright form, if required, should be returned no later than three weeks before the wedding. Click Here to download the form. The Weddings Administrator will contact you to discuss these and any other concerns several months before the wedding date. For a fee the bells may be rung after the service to celebrate your Marriage. For a wedding on a day other than a Saturday the fees may be increased. Please note that at Chalgrave the bells are chimed not rung. any additional readings you may like to have included in the service. An outline order of service is available to download here to assist you in preparing your Order of Service. A draft copy must be agreed by the Rector before final printing. You may wish to decorate the Church with flowers for your special day and each Church has its own team of flower arrangers who provide a very high standard of work. The cost of flowers is set by the Church Flower Arranagers in charge of each Church and is paid to them direct at least two weeks before the wedding when the flower display details are finalised. The cost will depend on the flowers used, their availability and size and number of arrangements. If more than one wedding takes place on the same day, the colours can be selected to suit all occasions and the cost shared between the couples. You may decide to arrange your own flowers or have them arranged by a third party, in which case you must agree this with the Church Flower Arrangers in charge and expect to pay a fee of £20.00 to cover church costs. They will advise you of the rules governing what you can and cannot do in and around the church building as it is important that church furniture and furnishings are not moved without permission and you must not fix decorations to the pillars or walls, inside or out, with nails, screws or other types of temporary or permanent adhesives. Please note that flowers may not be removed from the Church without the specific permission of the Church Flower Arrangers or Verger in charge. For weddings taking place during Lent or Advent, when flowers are not generally used in church, special arrangements can be made. In the event of a disagreement about where flowers are placed or how they are arranged, the decision of the Church Flower Arrangers is final. You will find it helpful to have two people to act as ushers to welcome your guests into the Church, hand out service sheets and direct them to their seats. Also, in the case of Chalgrave weddings, it will be helpful if you have another usher to see that cars are parked correctly. The Verger will make sure they understand their duties. Only one video camera may be used in Church for which a copyright fee is required. The Weddings Administrator will explain the procedure as a separate form has to be completed by you and the cameraman employed. Click Here to download the form. A Cam-corder cannot be used in Church during the wedding ceremony nor may guests use their personal cameras or mobile phones during the service. advise them to park sensibly. Please advise the Weddings Administrator, well in advance, if any of your guests require help to access the Church, by wheelchair for instance, so that the Verger can make the necessary arrangements. We have tried to cover most of the general subjects on this page but I am sure you will still have lots of questions. Please do not hesitate to contact the Rector, Organist or Weddings Administrator if you need help. Music plays an important part in a wedding service and can add very significantly to what is a very special occasion. It is important that any hymns which you decide to have are not only appropriate but also sung to reasonably well known tunes so that your guests can actually take part in the singing. The Rector and Organist will be happy to advise you on the choice of music when you meet to discuss the details of the service. beforehand. The Rector will give you the relevant organist details. Suggested Music to help you make your choice. March from "The Organ Symphony"
You may find it useful to search for any of the above music or the suggested Hymns on YOUTUBE in order to make your choice. These fees and charges are for 2013 only and are liable to increase next year. You will be required to pay the fees and general charges set by the parish and the diocese for the year in which your wedding takes place. Your bill will be given to you in advance of your wedding and payment must be made, at the latest, two calendar months before your wedding. Cheques should be made payable to Toddington PCC or Chalgrave PCC as appropriate.